This article goes live on December 25th, which is Christmas for a large majority of my American readers. I didn’t bring you any gifts, but I do have some words you can read about Magic on your phone at family dinner while trying to avoid conversation with irritating relatives that bought you packs of Pokemon. I’ve become aware of a trend in Planeswalkers lately that I want to bring to your attention. I’m going to say right off the bat that this is hardly conclusive, nor is it particularly revelatory. It’s mostly a pattern I’m noticing, and whether it’s signal or noise, I can’t be sure. In any case, it’s worth being aware of. 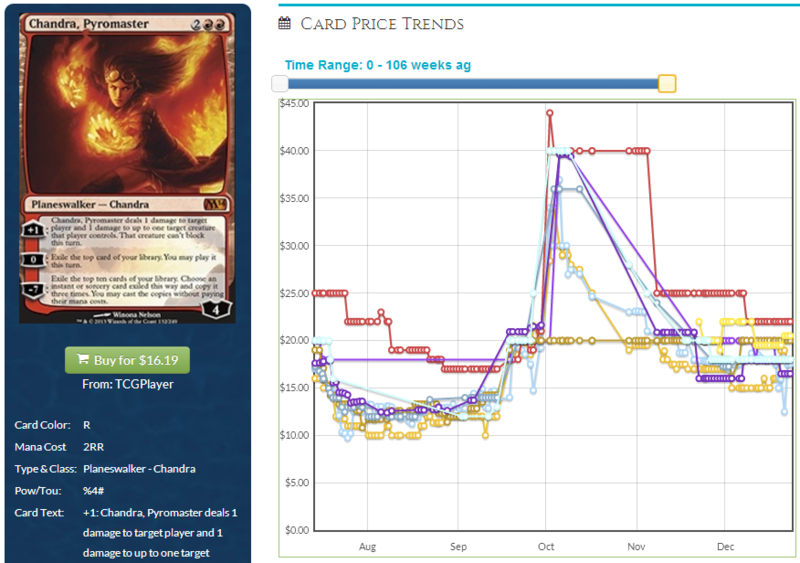 You see here that Jace started very high, as all Planeswalkers do post-Worldwake, and dipped all the way down to about $10-$12 early this year. 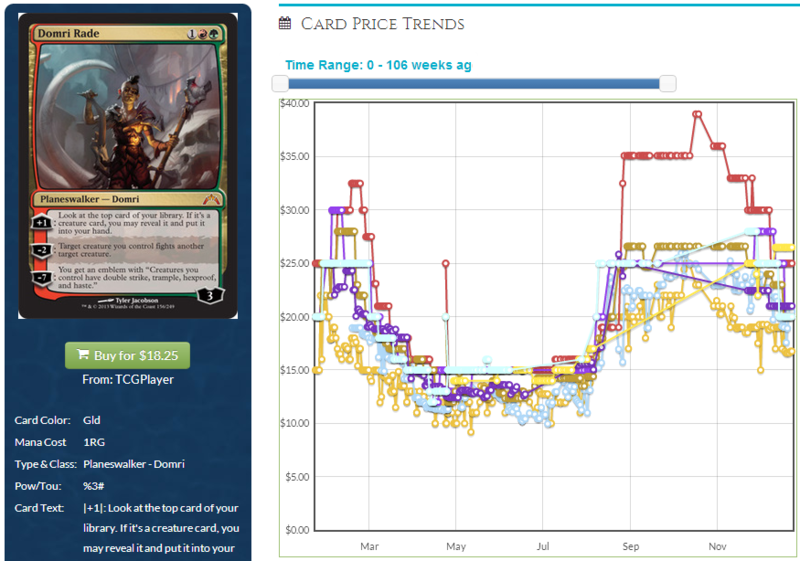 There was a small bump in early summer as speculators got on board, and finally in the fall he rose to ~$25, where he was looking like he could have climbed even higher had Jace vs Vraska not been announced. He now sits right around $20. Here is a very similar curve. He dropped to ~$12, then in the fall climbed to $25+. As with Jace, he has settled around $20. I think you’re beginning to see a trend here. All of these Planeswalkers have done the same thing. They dip in the spring to about $8-$12, then skyrocket in the fall. This isn’t exactly new information; lots of cards from the senior block have similar curves. The reason this is worth paying attention to in this case is because the good cards are already obvious. Not many people could have identified Desecration Demon skyrocketing, and only a few saw Nightveil Specter coming. Those rares that see 1,000% increases are notoriously difficult to predict. But the Planeswalkers are easy! They’re huge, obvious, splashy cards. No thinking required. They aren’t going from $.40 to $9, but $10 to $25 is still a good chunk of profit. It’s also not happening with every single Planeswalker. While the ones listed above have seen spikes, Vraska and Gideon haven’t jumped yet, and they are both from the Return block as well. 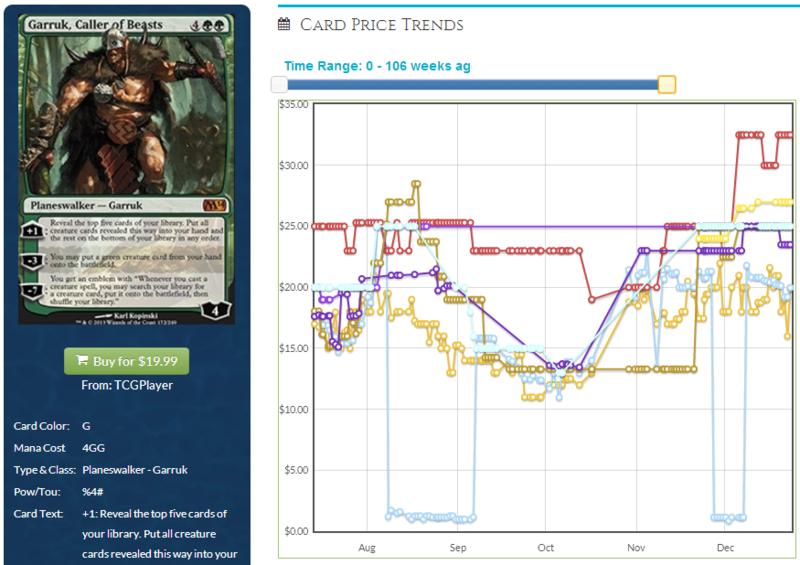 It seems that we have a fairly clear price curve for successful Planeswalkers. How can we identify them? Well, I’d say the block Pro Tour is a good place to start. Jace was all over the Top 8 of PT Dragon’s Maze, and Domri made a showing in the 18+ points list. Gideon was around, but only in Sideboards, and it doesn’t seem that Vraska showed up at all. 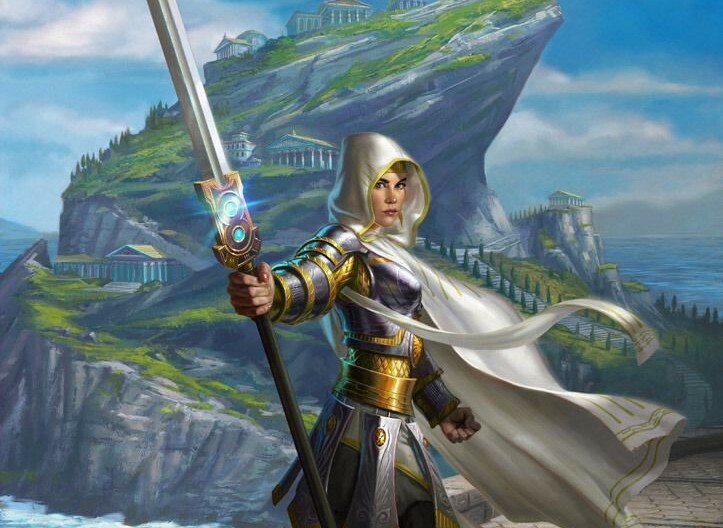 Outside of that Pro Tour, Domri and Jace were seeing play, while Gideon and Vraska were not. Chandra and Garruk are a little tougher to spot, simply because they didn’t have the Pro Tour to show off at. 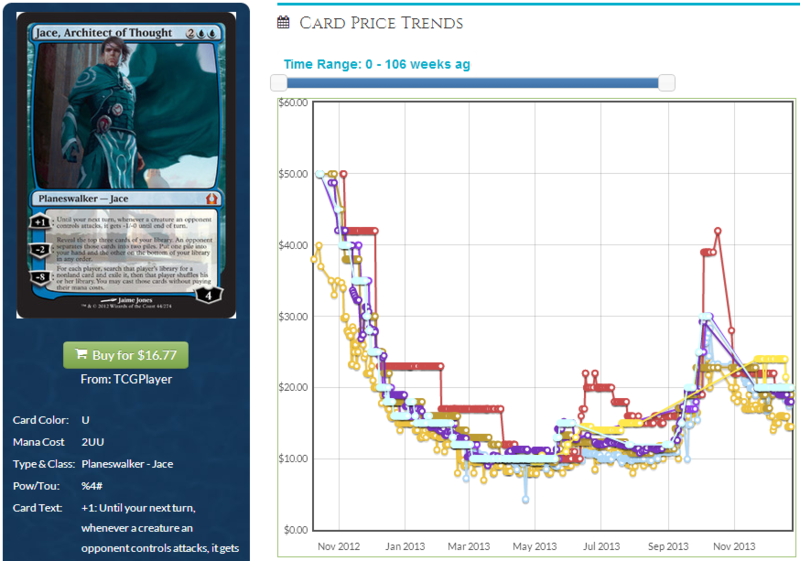 They move a lot faster; dipping within weeks of the core set release, and then spiking in sometime in October. The trick to catching core set Planeswalkers in the future will be watching for ones that seem to perform in the month and a half after release, but before rotation occurs. This seems to make a rather compelling case that any walker that has had reasonable success prior to their first summer will be a great pickup a few months ahead of the fall set. So far out of Theros we’ve had Ashiok, Elspeth, and Xenagos, who have all seen some amount of accomplishment. Are these the three we should be watching in the fall of 2014, or will the rest of the Theros block dethrone them?